Good morning, everyone, and welcome aboard for our 20th Mystery Quilt Train Ride. All returning passengers and new riders, please climb aboard and come to the club car for our meet-and-greet and some light refreshments. Clues will be posted on this thread, not a new one each week. So bookmark this page for easy return to the mystery. Today will be fabric requirements and you will begin to cut and sew next week. Clues will be posted by 8:00 Arizona time each Saturday. We don’t observe daylight savings time, so for you it would be equivalent to 9:00 Mountain daylight savings time. Our journey will end on Oct 20th with the final clue for assembly. From confident beginner to the experienced quilter, I think all will enjoy this mystery -- another scrappy. See note at the bottom for yardage requirements if you don’t want to use scraps. I also showed you some samples of what I thought might be good for a non-scrappy quilt. They are posted after SusieQ's posting. I hope you are not disappointed in that this mystery will be another scrappy. In fact, it was one that I planned on, and started to work on over two years ago, but was afraid some of you wouldn’t be happy with HSTs, so it languished in my PUP pile. But now after the #19 mystery, all of you “regular riders” are HST masters, and you can assure anyone who is leery of them, that HSTs are not the big old bad boogie man! The main thing to remember is accurate seams of ¼” and accurate cutting to proper size. Now, I know there are many of you that make large quilts out of these mysteries. Go ahead, make two, three, four times or more the number of blocks. It will be beautiful! I am showing you my initial scrap piles for using next week and the week after. In an upcoming clue you will need more medium-dark and dark scraps. Use as many different fabrics as you can. After all, variety is the spice of life as well as the beauty of a scrappy, right? 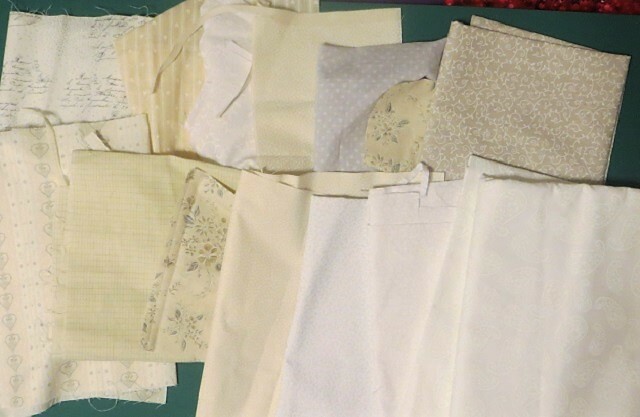 If you don’t have enough neutrals, go ahead and use yardage of a lighter solid or tone-on-tone if you don’t want to go scrappy on the part that will start next Saturday, Sept. 22nd. To replace my neutral scraps, You will need approximately 2 yards of this for next week and the week to follow. This fabric will need to contrast with your medium to dark pile of scraps. I tried to keep the second pile in medium, medium dark and dark. There are less medium than the other two values. But you can do whatever you want. The only thing to watch for: you should make sure if you are using a lot of light fabrics in that neutral pile that these darker fabrics contrast well with the neutrals or the final pattern will get lost. Note: Fabrics needed if Not doing scrappy. You must have contrast between all three of these fabrics. To be on the safe side, plan on 2 yards of each of the 3 colors. It may be a little less, I just did a rough calculation. You will use the light and medium next week, the dark at a later date. 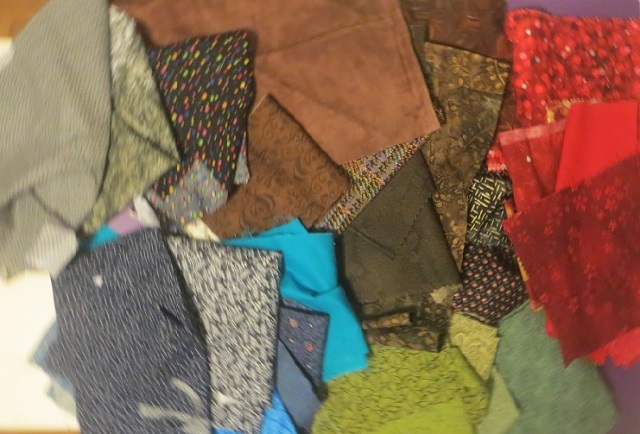 I also showed you some samples of what I thought might be good for a non-scrappy quilt. So off you go stash diving, or shopping. I will be around all day checking in every couple hours if anyone has a question. Enjoy! I'm going on vacation tomorrow for a week but I'm in!!!!! Oh how fun! I do need another scrappy! My scraps are always taking over my shelves. Thanks, Judy! This will be my first train ride and I'm excited! Welcome, NZ, we always have a lot of fun here, and it's a great place to meet new friends. Omaha NE Go Big Red!! Wonderful, can't wait to see what beauty this will develop. Thank you Judy. Hi, Kathryn. Glad to see you. This is going to be a real curious one, for sure. Looking forward to the clues. I found you !!!! Gonna grab a snack for the dinning car and then I'll be grabbing the train. Can't wait to get started! I am new to this, but looking forward to the train ride! Thanks for setting it up for us, Judy! Have a wonderful Quilting Day, make it your way! Angelia, Mary, Cindy and Christine - welcome back! Hmmm ... Angelia, wonder what size you will end up with? Mary, we'll wait for you, no rush.... are you bringing something good? Mariah, you gonna love this, isn't she? I'm also excited to begin this one...and as always, I have much difficulty choosing my combinations. I will need your help ladies. I'm looking forward to joining in. I've still got lots of scraps! HI, all. I am back again for this ride. I will have to dive into my stash but have plenty to get into. I have learned how to post photos so I when I get some colors pulled, I post for comments and guidance. Judy love your scraps. I'm making cabbage casserole. It is like cabbage rolls only layered in a baking dish. Yummy. Hi, everyone! As always, I am looking forward to this new mystery. Thanks, PaintMeJudy. But first, I need to recover from an exciting high school football game last night. LOL! It was definitely worth the drive to watch 2 great nephews play in a winning varsity game; 28-20. A bonus: the younger brother of one of them played at half time plus I saw extended family. I sure was tired the last few miles of my 2 hour trip home this morning. That does sound fun, Connie! We live right across the road from the local high school football stadium, so we get to watch some exciting games from our front porch. Count me in! Thanks so much! Really looking forward to this. Oooo good idea -- so much faster than making the little darlings by rolling them around the filling. Judy--I think I'll aim for about an acre and a half! LOL Don't doubt you for one minute!